This is a list of recordings of Don Carlos , an opera by Giuseppe Verdi known as Don Carlo in its Italian-language versions. 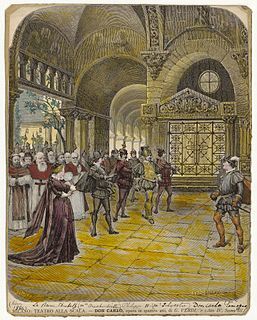 Don Carlos premiered as a five-act French grand opera at the Théâtre Impérial de l'Opéra in Paris on 11 March 1867. Luis Ernesto Alva y Talledo, better known as Luigi Alva is a Peruvian operatic tenor. A Mozart and Rossini specialist, Alva achieved fame with roles such as Don Ottavio, Count Almaviva and Fenton. He retired from the stage in 1989. Charles Anthony Caruso, better known by his stage name of Charles Anthony, was an American actor, and tenor noted for his portrayal of comprimario characters in opera. Anthony had the distinction of appearing in more performances at the Metropolitan Opera than any other performer. He celebrated his fiftieth anniversary with the company in 2004, and gave his farewell in the role of the aged Emperor Altoum in Turandot, at the Met, on January 28, 2010. 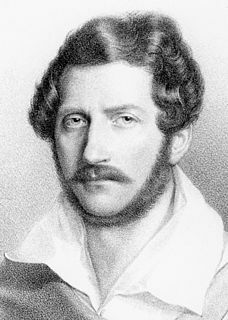 Il diluvio universale is an azione tragico-sacra, or opera, by Gaetano Donizetti. The Italian libretto was written by Domenico Gilardoni after Lord Byron's Heaven and Earth and Francesco Ringhieri's tragedy Il diluvio (1788). This is a list of recordings of Elektra, a one-act opera by Richard Strauss with a German-language libretto by Hugo von Hofmannsthal. The work was first performed at the Dresden State Opera on 25 January 1909. This is a discography of The Tales of Hoffmann by Jacques Offenbach. The list includes live and studio recordings available in audio CD, VHS and DVD. These lists show the audio and visual recordings of Il ritorno d'Ulisse in patria by Claudio Monteverdi. The opera was premièred in Venice in 1640, initially in five acts, and was then performed in Bologna before returning to Venice for the 1641–42 season. The music was subsequently lost; modern productions of the opera have been based on editions derived from the sole manuscript score, a three-act version discovered in Vienna in the 19th century. Performances were rare until the 1970s, when after stagings in Vienna and at Glyndebourne, both of which were recorded, the work entered the operatic mainstream. Since that date recordings have been issued regularly, in five-act, three-act and two-act versions. ↑ Met telecast of 21 February 1980 at the Met Opera Archive. ↑ Recording details taken from the 2010 Met DVD of the February 1980 telecast, from the DVD collection "James Levine Celebrating 40 Years at the Met"
↑ Met telecast of 26 March 1983 at the Met Opera Archive.